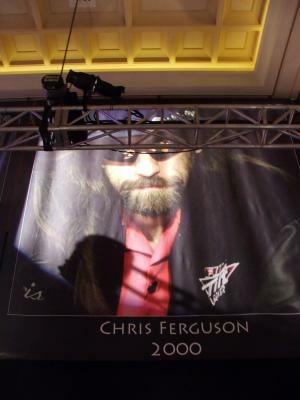 Pokerati » Blog Archive » Walking on Watermarks Why Is Chris Ferguson Special? Why Is Chris Ferguson Special? IT’S A MIRACLE: Full Tilt wasn’t exactly a poker powerhouse in 2000, the year Chris Ferguson won the main event. Chris Ferguson, whose banner lords over the 75/150 Omaha-8 game that has been going on all night and through the morning, commemorates his 2000 win over TJ Cloutier. But look a little closer and you’ll see this photo is hardly authentic — it bears a Full Tilt logo … branding op for a company that didn’t exist at that time. All the other banner mugs feature pics from the feat in question. The real Chris Ferguson, circa 2000. 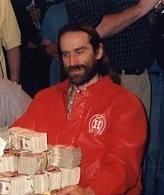 UPDATE: Actually there are two of them like this … The picture of Dan Harrington supposedly from 1995 shows him fully decked out in 888 and Pacific Poker gear. I think there’s more than those two, McEvoy’s looked pretty recent as well from pictures I’ve seen. Yes, I hate when the facts get in the way of my conspiracy theory. I could make up something for you Dan. How about spreading the rumor that NBC will pick up the WPT. It’s true! They are going to package it with the PokerBowl.